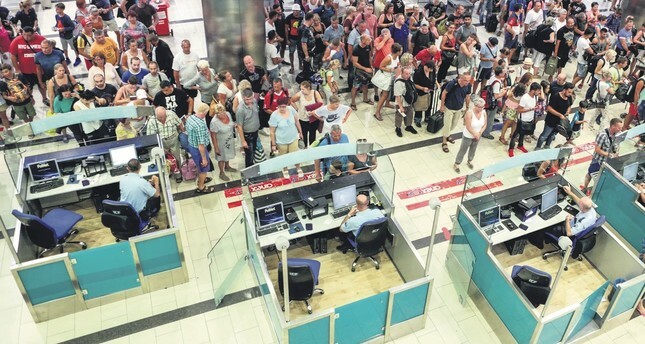 Tourists wait for security and passport control at Antalya International Airport on Sept. 10, 2016. The number of German tourists outscored Russian visitors coming to Turkey's top tourism resort Antalya by 8 percent in November and 3.7 million Russian tourists came to Antalya during the January-November period. This figure outdid the same period of 2014 and 2015, which is known as the best period for Russian tourists, and slammed the same period of 2016 by 688 percent. In the first 11 months, a total of 9.6 million tourists arrived in Antalya, while Russian tourists constituted 38.42 percent of this figure. On the other hand, even though German tourists experienced a decrease of 16 percent compared to the first 11 months of last year, it was observed that they left behind Russian tourists by 8 percent in November. According to the Civil Administration Office, Antalya, which hosted 469,555 Russian tourists in the first 11 months of 2016, welcomed 3.7 million Russians in the first 11 months of 2017, with an increase of 688 percent compared to the previous year. With this figure Antalya left behind the same period of 2014 and 2015, which is known as the best period for Russian tourists. Antalya had hosted 3.5 million Russian tourists in 2014, followed by 2.8 million in 2015. In the first 11 months of 2017, a total of 9.6 million tourists arrived in Antalya, while Russian tourists constituted 38.42 percent of this figure. Meanwhile, in Germany, the champion of 2015 and 2016, a decrease of 16 percent was observed in the first 11 months compared to the previous three years. However, an increase was also experienced in the number of German tourists in November, which is generally preferred by the elderly in the winter months. The number of German tourists coming to Antalya in November stood at 42,764. Regarding the distribution of tourists in Antalya in the first 11 months of 2017, Russia led the way with a share of 38.42 percent, followed by Germany with 16.87 percent, Ukraine with 7.41 percent, Britain with 3.72 percent, the Netherlands with 2.65 percent and Kazakhstan with a share of 2.46 percent. Despite the political crises experienced between the two countries, it was observed that the Germans, who preferred Antalya as a holiday destination like Russia, had a 16 percent decrease compared to the first 11 months of last year. In the first 11 months period, 1.6 million German tourists visited Antalya, while the number of German arrivals in November reached 42,764. The share of the Germans in the distribution on country-by-country basis was 30.23 percent, while in the same month, the number of the Russian tourists stood at 31,585 with a share of 22.23 percent.